This guide is for the 1980 arcade game. For the 2016 Microsoft Windows and Mac OS X game, see Tempest (2016). 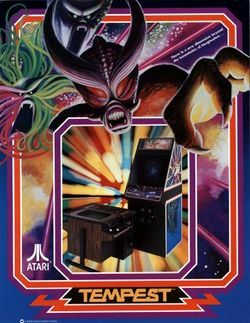 Tempest was an arcade game, developed by Atari in 1980, and was the first game to make use of Atari's Color-Quadrascan technology, which was a colored vector display system. Previously, vector monitors can only produce black and white images, or at best, shades of gray. However, since Atari used vector displays in quite a number of games, they developed a technique to display vector graphics using different colors. This made Tempest stand out equally among monochrome vector games and colored raster games. The object of Tempest is to destroy every enemy that is attempting to climb out of an electric well. You control a weapon, with the dial, that can circle around the outside edge of the well (assuming that it's circular, some boards are not) firing shots down each of the columns. Enemies are only vulnerable as they are rising out of the well, and enemies that make it to the outer edge become especially dangerous for the player. The player is given one alternative "Zapper" weapon to use each stage in case of emergencies. Tempest was quite a success at the arcades. However, unlike Asteroids, it was difficult to take the crisp clean graphics that defined Tempest, and port them successfully to early home consoles. They simply didn't have the resolution or the graphical processing power to do it. While prototypes have been discovered for the Atari 2600 and the Atari 5200, official conversions were not released until 1987, when the game appeared on several popular British home computers. In response, Atari published an official conversion for their Atari ST line of 16-bit home computers. Tempest saw an update in 1994 as Tempest 2000, initially for the Atari Jaguar, but also released for Windows, the Sega Saturn, and Sony Playstation. Another sequel, Tempest 3000 was developed for the doomed NUON hardware. There's no back-story to Tempest, but the origins of its creation are interesting. Designer Dave Theurer started out trying to develop a first-person variant of Space Invaders. His initial experiments were not too successful. One night, after having a nightmare about aliens or monsters climbing out of a hole, Dave sat down and started to redesign the game, and Tempest was the result. This page was last edited on 14 September 2017, at 15:00. This page has been accessed 22,281 times.